Sponsored Post: Not happy with your current cable company? posted by Lisa Ace in Sponsored Post, advertisement, Empire Access, cable, internet, Phone, Offers..
posted by Lisa Ace in Sponsored Post, advertisement, Empire Access, cable, internet, Phone, Offers. 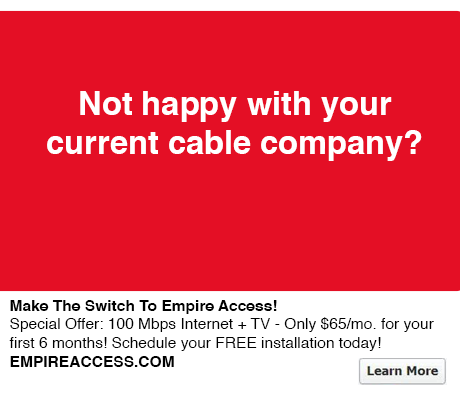 posted by Lisa Ace in Sponsored Post, advertisement, cable, internet, Phone, Empire Access. posted by Lisa Ace in Sponsored Post, advertisement, Empire Access, cable, internet, Phone, service..
posted by Lisa Ace in Sponsored Post, advertisement, Empire Access, Double Play, internet, Phone. posted by Lisa Ace in Sponsored post. advertisement, Empire Access, digital television, internet, Phone.